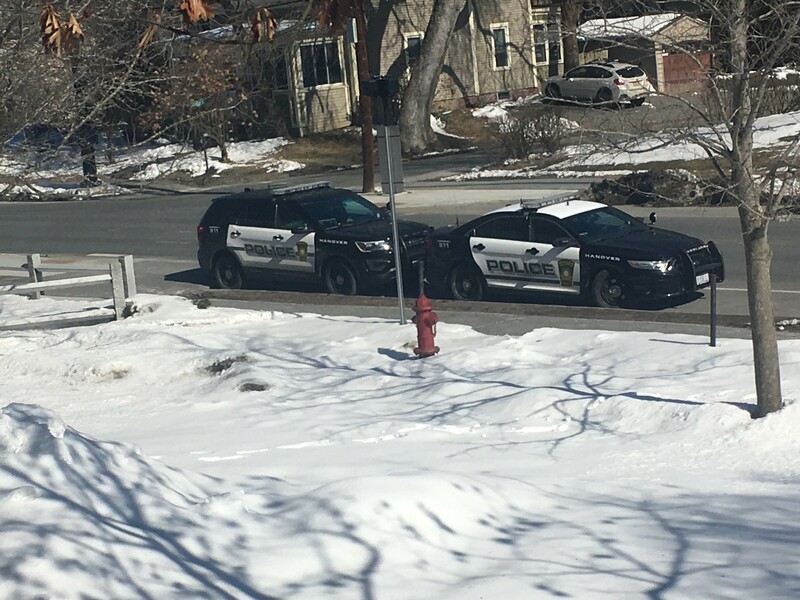 Fears of a potential school shooting at Hanover High School were triggered on Tuesday, March 20, after an account emerged on social media that made threats against the school and hinted at a possible attack. The entity behind the threats is still unknown to the public, although the Hanover Police Department have traced the account to an IP address outside of the Upper Valley. The account, which was created on the social media website Instagram, was discovered by several Hanover High students on Monday night. 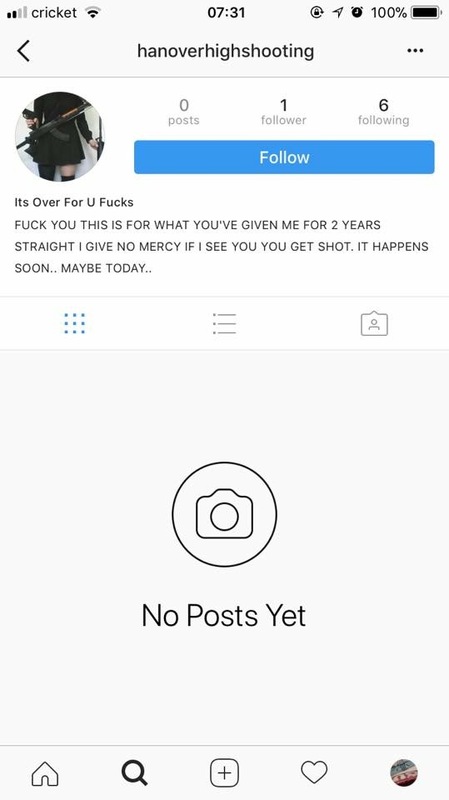 Utilizing the handle “hanoverhighshooting” and officially going by the name “Its Over For U F**ks”, the account had followed a handful of Hanover students and declared in its bio section, “F**K YOU THIS IS FOR WHAT YOU’VE GIVEN ME FOR 2 YEARS STRAIGHT I GIVE NO MERCY IF I SEE YOU YOU GET SHOT. IT HAPPENS SOON.. MAYBE TODAY..” Nothing else was available for viewing on the account aside from a photo of a person’s midsection and several firearms. A Google image search revealed that this image had existed on other websites as far back as 2013. At the time of publication, the account is still up. 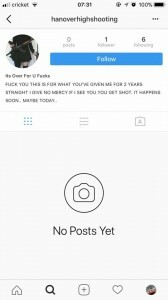 A screenshot of the Instagram account in question. The numbers of accounts that follow and are followed by the account in question have changed over time. Overnight, screenshots of the account’s main page were shared by students and parents, some of whom contacted the Hanover Police Department and school staff members. An announcement filed by police chief Charles B. Dennis stated that the department received word of the threat at 6:26am on Tuesday. That morning, multiple police officers could be spotted around HHS. Both Principal Justin Campbell and Superintendent Jay Badams sent out e-mail messages to the student body about the threat. In the first of these e-mails, which was sent out 16 minutes before the start of school, Campbell wrote, “Earlier this morning several students forwarded an Instagram post to various staff members. The post is threatening in nature. The Hanover police department is working to determine the identity of the individual behind the account. Additionally the Hanover PD will be present in the school today.” Campbell also said that there would be no access to open campus. To make sure that students who remained at school heard the announcement and were accounted for, the administration told students to go to their Common Ground rooms twice during the day. In response to the threat, a large number of students either opted not to come to school to begin with or left partway through the school day. The halls and classrooms of the school steadily became more and more empty as the day progressed, with many late morning and afternoon classes having only a handful of students. According to a count from the front office, 467 of the school’s approximately 725 students were present for less than half the school day. Parental approval in person or by phone was required to have a student released from school, so many parents came to the school throughout the morning to sign their children out; the school received many phone calls from parents as well. The students who remained found the building to be unusually quiet. Students had mixed reactions to the threats. “When our classes are emptying and people are trickling out of school the whole day, it’s hard not be a little scared… There’s an unsettling mood around the school,” senior Johanna Bandler said. She was not the only one who felt a but uncomfortable. “It shakes you a little bit. It’s good that the school has gotten the police involved,” said senior Dave Wilson. Despite the unease, the district Superintendent Jay Badams praised the way that the school handled the threats. “It is unfortunate that we are forced to react to anonymous threats, but tragic events at schools throughout our nation have shown us that we need to take such threats seriously,” he wrote in an e-mail addressed district-wide. “I am pleased to report that our students, teachers, principals and staff did an admirable job today ensuring that our children were safe.” An e-mail update from Principal Campbell said that the school would resume its schedule on Wednesday as normally planned. As of now, the true nature of the threats is unknown. It has been speculated that the threats were a prank, although others have considered that it might be an actual threat or possibly just fear-mongering. There is currently not enough evidence to indicate anything conclusive. Hanover High students Kathryn Mulligan and William Brannen told the Broadside via an e-mail interview that they had found a sketchbook that showed graphic illustrations that may have been related to the threats while searching through the school’s “Lost & Found” on Monday. The two students saw multiple pages of “graphic images of kids being shot at and knifed brutally,” in Mulligan’s words. Brannen added that there had been drawings “that showed a restrained cartoon character getting hit by a bat, another being shot by a ‘gangster’, and what may have looked to be a character using a knife on its face.” Brannen said that the findings were reported, although neither the police present at the school nor Principal Campbell were able to comment on the sketchbook specifically. It is unknown as to whether the sketchbook has any relation to the threats made on Instagram. The investigation is set to continue for the next few days. Those with potential information on the subject are encouraged to call the police department at 603-643-2222.